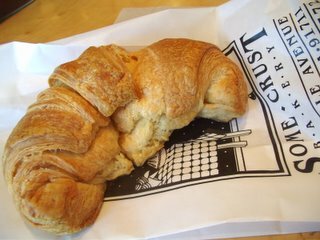 Located in the Village, Some Crust Bakery is definitely the culinary gem of Claremont. 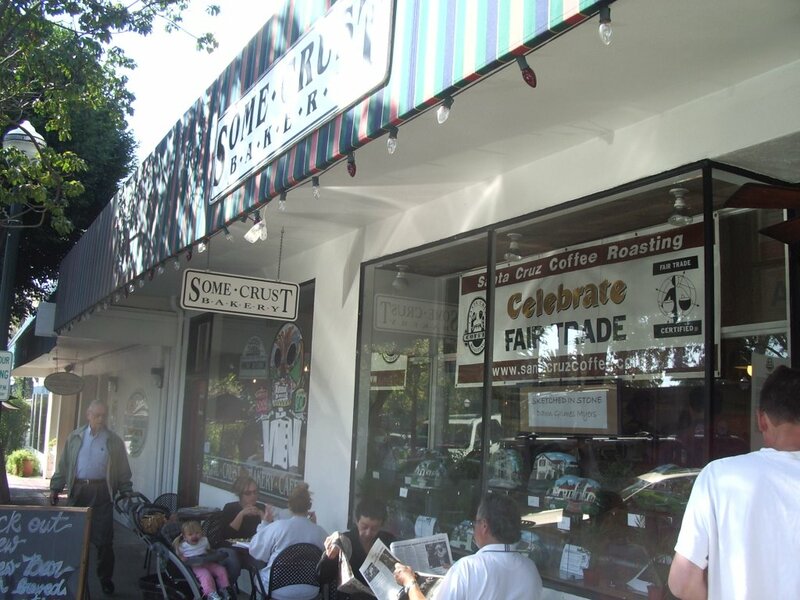 It is a quality bakery by most standards but the raves it recieves from the people of Claremont can be partially attributed to the fact that the food options in Claremont, especially in terms of bakeries, are really limited. Some Crust opens up at 7:30 (on Sundays) but there are plenty of people milling out in front of the shop by 7 am, eagerly awaiting their daily indulgence. I stopped in around 9 this morning and was delighted to discover that they had just taken out a fresh batch of croissants. Hooray! I quickly purchased one ($1.75) and ran to the Starbucks next door to devour my baked good (they had no more seating in the bakery). Oh yes. It was good, though nothing like a traditional French croissant. I suppose you could say they “Americanized” it with excessive (even more so than the usual croissant) quantities of butter. The croissant was slightly under baked, resulting in a doughy interior, but the crust was satisfyingly delicious. A rich, thick, nearly pie-like crust was flaky and shortbread like at the same time – I hope that made sense. It was like a cross between a normal croissant crust, pie crust and shortbread cookie. Then throw in the words “warm” and “buttery” and that’s what I had. Nothing beats fresh pastries on a Sunday morning. Some Crust offers a myriad of pastries and breads from scones and danishes to challah and sourdoughs. Most of their products like the bear claws and crumb cakes look really sweet so I tend to stick to the more “neutral” or savory goods. They also have a sandwich shop next door, which I have yet to try. The service is a bit surly and could be improved, but as long as I have a warm croissant in hand and perhaps a cup of chai, I’ll be perfectly happy. I’m no expert on Niu Rou Mein (like Kirk! ), but I think I know a good bowl when I see one. 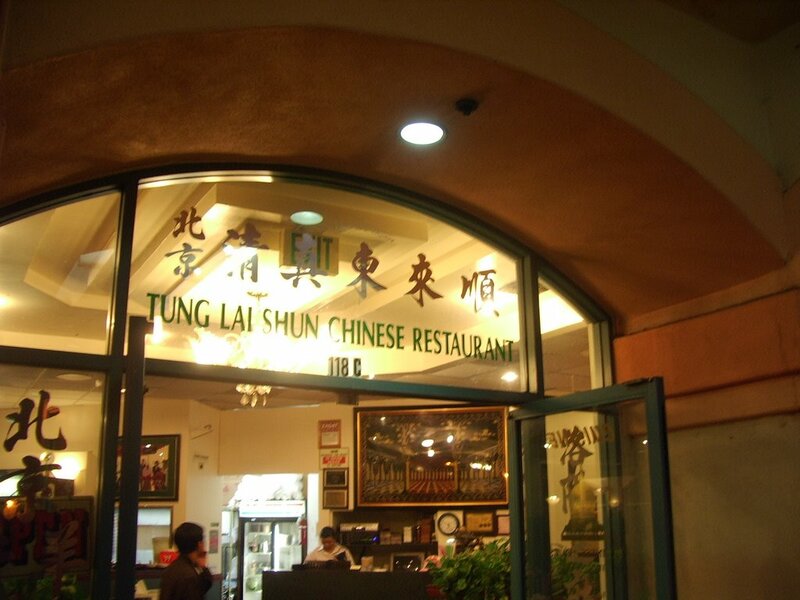 :) A friend and I had planned on having dinner at Vietnam House but ended up at Tung Lai Shun in the 99 Ranch Shopping Plaza after we took a look at their menu (besides, we were very hungry from all that grocery and bakery shopping). The restaurant was nearly full by the time we were seated at 6pm. 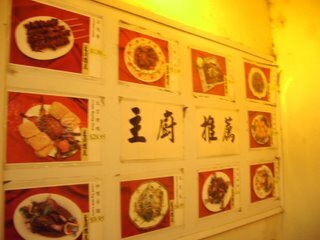 The place is run by a Chinese family but specialize in many lamb dishes, the English name for the restaurant is “Islamic Cuisine.” My friend loves lamb, I love lamb – why not? That was probably the best dining decision I’ve made in a long time. I asked the dished to be prepared very spicy, it came out very hot from the kitchen no more than 10 minutes after I placed my order. It was incredible. 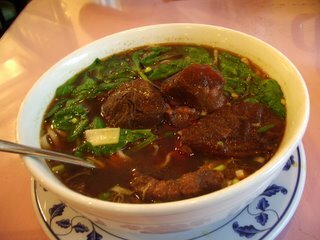 The broth was rich, flavorful and very very spicy (just how I like it!) And the meat? So tender with bits of tendon and fat attached – it required nearly no chewing on my part. They gave four pretty large pieces, but I was still craving more. The hand made noodles had just the right bounce and chew to them. There was plenty to go around. The dish was topped with spinach, green onions and chili pepper. You could see the shallow layer of fat (the good flavorful kind of fat!) floating at the top of the bowl, dark red in color and spotted with chili, I couldn’t bear to scoop the oil onto the side (like some health conscious people do). The soft, juicy beef and the heat of the soup went together perfectly, I’ve never been so content with a bowl of Niu Rou Mein and could have easily polished off another bowl! We also had an order of the “Lamb and Pickled Vegetables Noodle Soup.” ($5.95) You thought the Niu Rou Mein was good? This was even better! A lamb based soup cooked with picked vegetable gave the dish a savory/sour kick. It was a light noodle soup that left you very full but not weighed down at all. They used fun sie (sp?) 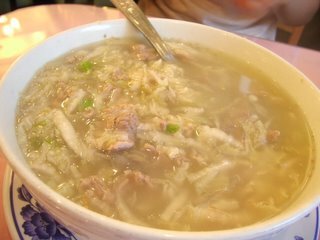 – the skinny clear noodles and finished off the soup with a fair amount of lamb, picked vegetables and onions. This was the first time I’ve ever had a dish like this and was surprised by how well the flavor of lamb and the sourness the vegetables provided combine together. The dish just felt very cleansing, almost healthy, if that makes any sense. My friend added a quite a bit of vinegar to her share but I though the savory/sour balance was just right. Funny thing was, after finishing the soup we were really full but got hungry pretty soon after. I guess that’s what sour dishes do to you! 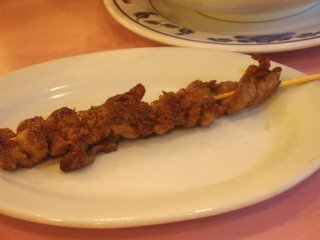 Threw on a Lamb Skewer ($1.50) at the last minute. It was grilled till the exterior was nice and crisp while the meat remained hot and juicy. Oh man, this was one of the best meals I’ve eaten in such a long time. I am coming back for sure! The prices are very reasonable, the service was “good” (relative to other Chinese restaurants) and the food? Incredible! Gah. Just so good. Afternoon snack! The wonderful thing about the Rosemead and Alhambra area is that you can find an abundance banh mi’s shops on every street. 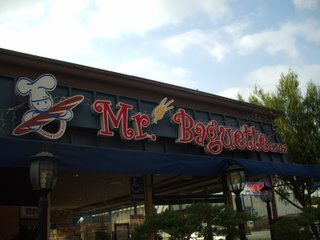 I usually go to Lee’s Sandwiches or one of the smaller mom & pop banh mi shops but when I’m craving a durian or avocado smoothie, it’s Mr. Baguette for me. It looks like a chain restaurant but is just owned by one man (though I’ve heard he has plans for another location). The place is designed to resemble a French cafe with tall black antique lamps and wicker tables and chairs. The French “vibe” doesn’t really come through with all the traffic right outside. 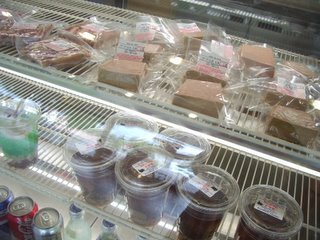 In addition to banh mi’s, Mr. Baguette also sells many Vietnamese desserts such as Sam Bo Lung as well as Vietnamese takes on traditional French pastries like brioches, croissants and pate chaud’s. They also carry pate by the pound. I’ve developed a bad addiction to pate, buying it by the pound (or two) and smearing it on toast for breakfast. Ah, no better way to begin the day than by clogging up my arteries! I ended up getting the #11 the bacon banh mi ($2.55) and a durian smoothies ($3.25). Durian smoothies are just about the best thing in the world! (They come only second to avocado smoothies). I never understood why so many people dislike durian – its such a wonderful creamy, sweet fruit. And the smell? It’s not that bad. But take durian blend it with milk, ice and a bit of sugar and voila, it’s the ultimate durian dessert. The best part is when you get to the bottom and find bits of durian that haven’t been completely blended in…oh..so ono! I’ve never had a bacon banh mi before and thought I would give it a try. Eh. 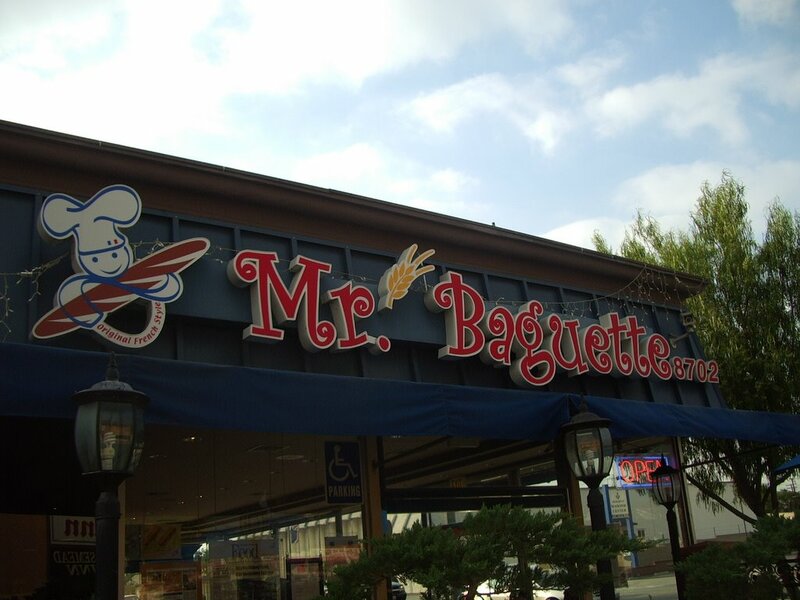 Mr. Baguette’s sandwiches are just decent to begin with. The bread is usually too crispy and dry with no balance between the soft “innards” and the crust. They really skimp on the meat and refuse to put the pickled veggies, cilantro and chilis in the sandwich for you (see the plastic bag?). The bacon was hilarious. I wish I took a closer picture, but it was nothing like the American bacon we’re used to seeing. It was bright pink and tasted like extremely salty char siu sliced thin. It didn’t help that there was so much bread and hardly and meat or veggies. I think I will stick to the traditional combo banh mi of pate, vege ham and sausage. Of all the wonderful banh mi shops in this area Mr. Baguette makes below average sandwiches but the excellent durian and avocado smoothies. I suppose what keeps people coming is the cleanliness of the shop, it is very well kept and has an almost sterile atmosphere. Orders are placed, then shown on the screen like McDonald’s. When your order is ready a machine calls out your number in English and Vietnamese. You come to the counter and your order is handed over the counter. Very orderly! Kinda takes the fun and adventure out of your dining/take out experience, no? But no matter how much I complain, I know I’ll be back the next time I’m craving a smoothie. Stopped by Mrs. Beasley’s in Pasadena the other day. The shop is located right off Pasadena’s main shopping area on Colorado Blvd. A few years ago I received one of their lemon bundt as well as chocolate chip fudge cake in the mail. While they were both overly sweet I loved how moist and dense the cakes were. I had always thought Mrs. Beasley’s was a mail order business so was surprised to discover that they had retail outlets. Look! Free samples! I love samples. The picture above is of their lemon and chocolate chip cake I just mentioned. 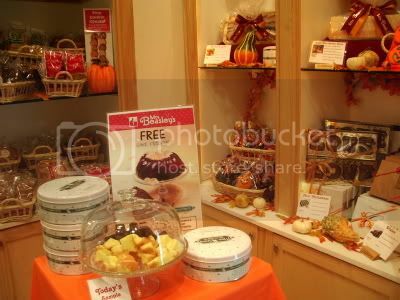 Mrs. Beasley’s also carries cookies, truffles and other baked goods but is mainly known for her cakes. All the products in the store just screamed sugary sweet, everything from the color of their cakes to the elaborate and excessively garish packaging was a bit overwhelming. Perhaps they could turn it down a bit to appeal to customers more interested in eating as opposed to looking? After all, you can please the eye, but in the end it is the stomach (or at least in my case!) that makes the decision! The girl behind the counter pushed me to try their new line of cupcakes, “you can only get them in the stores!” They vaguely remind me of Magnolia cupcakes (with which I have a love/hate relationship – love the asthetic appeal, hate the actual cupcake…) in the sense that there is a TON of frosting. A ton as in 3 inches. I like quality frosting as much as the next person but I started to wonder if Mrs. Beasley was going for quality or quantity. 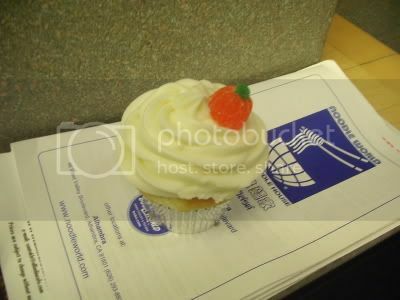 Nonetheless, I purchase a cream cheese cupcake ($3) – a yellow cupcake base with a tower of cream cheese frosting. They threw a pumpkin on top becuase it’s almost Halloween. 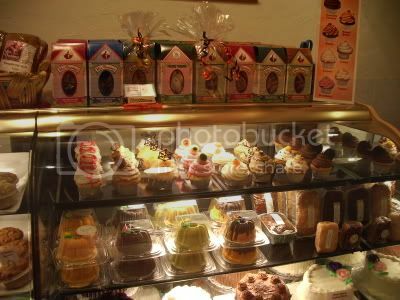 Like their bundt cakes, the cupcake part was dense and moist, more like a pound cake than cupcake. I’ve always expected cupcakes to be on the lighter, delicate side, but I do like the dense texture of their goods. The cake base was not too sweet but heavy on the vanilla flavor. As for the frosting? I only managed to eat about half before I started to feel cavities growing everywhere in my mouth. This was definitely better than the average frosting, light and fluffy, the flavor was pure cream cheese and nothing else (except probably a ton of fat). I probably won’t go back for another cupcake, lest I’m craving a heart attack but I enjoyed visiting the cherry, brightly light shop. Man, this really makes me miss the good old family and one of a kind bakeries in Manhattan. The big corporation thing is kind of a gloom over Mrs. Beasley’s name! Oy, neato! Free lunch and art tour? I’m up for it! 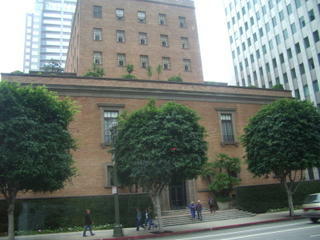 :) The building is located in downtown LA. It’s definitely a shortie admidst the tall financial buildings that dominate this area. As you can see it a very simple, unassuming, never-would-think-that-this-is-an-exclusive-club-building, maybe they did it on purpose? lol. The art tour was nice but I was here to eat! 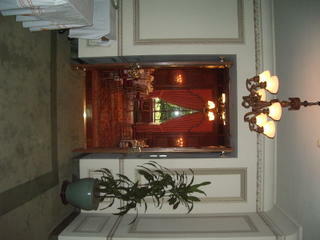 Here is the entrance to the dining room. Another shot. The room had 6 tables of 10. There is a larger dining room next door that can seat 500 people. First course (notice I have improved my picture taking skills! 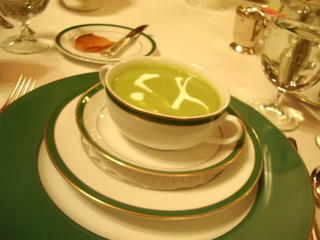 ): piping hot asparagus soup with a swirl of creme fraiche. It was so soothing with its thick and velvety texture. The fresh asparagus flavor clearly shown though and was appropriately highlighted with the creamy cool tang of creme fraiche. 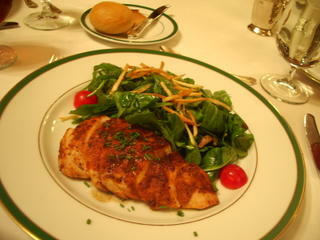 The main entree was a warm mushroom, spinach and arugula salad tossed in a lemon vinagrette. The salad was topped with a confetti of “homemade” shoestring fries. This was served alongside with tender slices of balsamic herb chicken. The salty and crunchy fries were a nice complement to the salad. However, I was sad to find only 3 thin slices of mushrooms, oh well, worse things have happened! I love pairing balsamic with just about anything, and thus appreciated the thick, mellow sweetness the vinegar provided to the chicken. 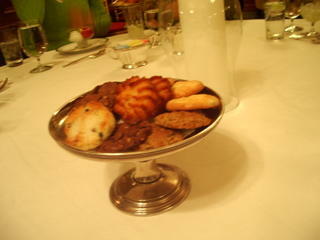 Dessert was preceeded by a tray of assorted cookies. Clockwise from the top: coconut macaroons (wouldn’t it be just awesome if they were french macaraons instead:) ? ), chocolate chip cookies, almond meringues, oatmeal raisin cookies, fudge brownie bites, soft, scone-like raisin cookies, and walnut rounds. I ate them all. I must have a million cavities. I liked the raisin ones the best, though they were more like scones than cookies with their soft, crumbly, biscuit-like texture. 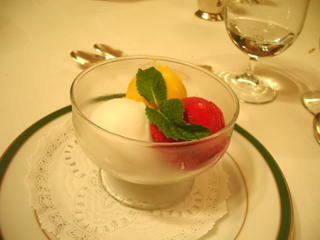 Desset was a trio of sorbets: coconut, mango and raspberry. The coconut was crazy good! It had little chunks (not shreds!) of fresh coconut. The texture was thick and creamy, just bursting with the taste of the fragrant coconut flavor. The mango was too sweet but I liked the silky smooth texture of the sorbet on my tongue, and the raspberry was bleh. It tasted like those articifical lollipops. It was a lovely lunch though I fear my expectations were set a bit too high. The soup was my favorite part of the whole meal. Fall = soup season! Warm, soothing soups does wonders for your mood. Will I be back? haha. let’s see if I ever get extended another invitation! 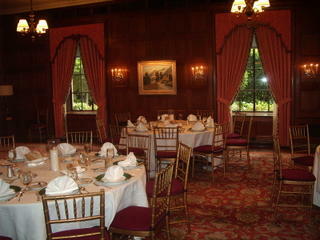 The tour and lunch was a wonderful experience to the “California Club” lifestyle. Now how about another bowl of soup?